So I think we've completely demolished the backyard. Yup. I think there are only a handful of plants left in our lot... absolutely amazing. Only about a half dozen trips to the dump... yay! boo. Now that we're nearly done with the plant removal, we're onto the real demo... the patio cover, the horrible (sorry previous owners!) gray brick patio, part of our 2 decks, the concrete walkway, the rock BBQ and the hot tub barrel horribleness. Wow! Seeing that in print makes me realize we have our work cut out for us... but demo work usually goes fast... hopefully. After the demo... some edging, sprinklers and finally grass. Boy, that makes it sound so easy... Thankfully through our great new neighbors we've found a contractor that might be helping us with some of the more wretched tasks like digging out roots left by the big pine tree. Speaking of roots, we have this ridiculous bamboo clump near our fence and let me tell you... I'm against it. Today, we attempted to dig out some of the new shoots. Ugh. I will only wish bamboo on my worst enemies... perhaps this is a job for the contractor as well. 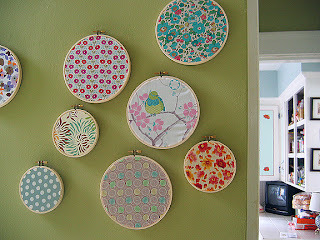 Then I'm thinking maybe something like this on one of the other walls like the hallway... Looks so easy, no? I think I could even use just some scrapbook paper... God only knows I have enough to wallpaper my whole friggin' house inside and out!